Hooray hooray outdoor grilling starts today! And on that note, this is a reprint from a couple a years ago about safe grilling. Enjoy. Grill season is just around the corner. Before you start cooking, make sure that you get your grill cleaned and in tip-top shape. Be sure to check back often as our Grill series continues. Make sure that you purchase propane or charcoal so that you are ready to clean your grate. Then if your grate has burnt-on food from your last grilling extravaganza, you’ll be ready when it’s time to fire up the grill. After about 15 minutes, scrub the grate with a stiff wire grill brush until all food particles are burned or scraped off. Let it cool down and cover. 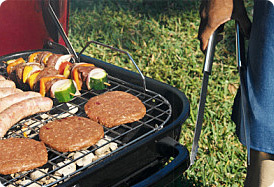 Spray the cold, clean grate with PAM® for Grilling Spray (and your utensils, too). Then preheat grill about 15 minutes before starting to cook. After cooking, scrape grill down with grill brush to remove burnt-on particles. ‘Cook’ another 15 minutes to help burn off remaining traces of food. Brush once more and extinguish fire. You will have a clean grate for your next meal. Choose a thicker cut of meat and fish for more tender and flavorful results. Trim excess fat from meats, leaving only about 1/4 inch of fat for flavor. Less fat helps avoid flare-ups and makes cleaning easier. To avoid cross-contamination when handling raw meat, always bring out two plates when grilling—one for the raw meat and one for the cooked meat. Wash and cut veggies in half or into 1/2 inch thick slices that won’t fall through the grate. Smaller vegetables can be skewered for easy grilling—or use a grilling basket. Spray vegetables lightly with PAM®; season with salt, if desired, before cooking. Use long-handled tools and long barbecue mitts to protect your hands from the heat. Use tongs to turn and serve the meat, not forks—you will pierce the food and lose flavorful juices. Use a meat thermometer to help determine internal temperature. Spray PAM® For Grilling on the cold grill and tongs.